The engine repair was completed on Friday and the weather was finally looking good for the passage south on Sunday. So we anchored outside St Georges on Saturday and spent time cleaning the bottom once again - getting rid of the barnacles that had attached themselves while we were alongside awaiting the engine part. On Sunday we sailed round to Prickly Bay on the south side of the Island and anchored there to prepare for night passage. The passage to Trinidad is about 90 miles and too long to do in daylight. So it's better to leave at dusk and approach the new island in the light. Venezuelan pirates were active about 4 weeks ago, attempting to board a catamaran on passage from Grenada, so going in the dark is also safer. There was a lot of concern in the yachtie community and boats tried to go in company wherever possible. 4 other boats made the passage the same night as us and while we were several miles apart, we were in radio contact every hour which was reassuring. We used the SSB radio so we could not be picked up on the VHF radio. Apart from looking out for pirates and a lumpy sea to start with, it was a really good passage. We had good winds and sailed close hauled all the way, making 6 to 7kts. Half the moon gave us light for half the night and then it was pitch black until we approached the gas platforms. We had to pass between 2 gas platforms (like the platforms in the North Sea) about 8 miles apart, and both were lit up like Christmas trees. There were also lots of ships around them, but just for once none came close to us and we were able to hold our course the whole way across to Trinidad. Neither of us got much sleep. We tried to get back into a watch routine, but reporting on the radio every hour or so made it difficult. The coast came into sight soon after it got light and the sails came down about 09.00 on Monday morning when the wind disappeared on entering the channel between the island of Monos and the mainland of Trinidad. 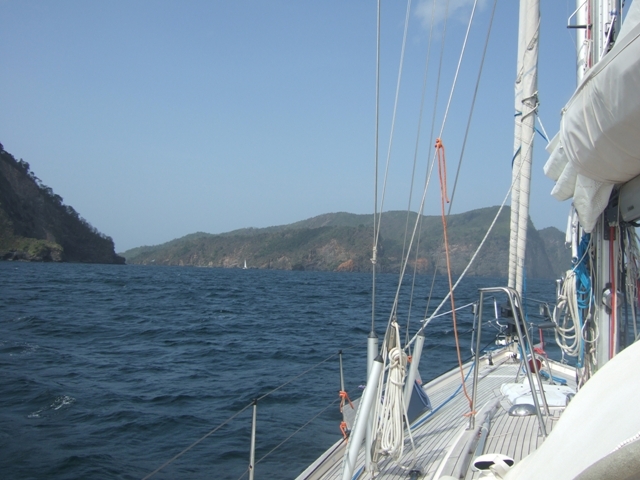 Having not pushed the motor since the repair, we motored very gingerly into the Gulf of Paria between Trinidad and Venezuela and on to Chaguaramas Bay, in the north west, where all the yachting facilities are in Trinidad. 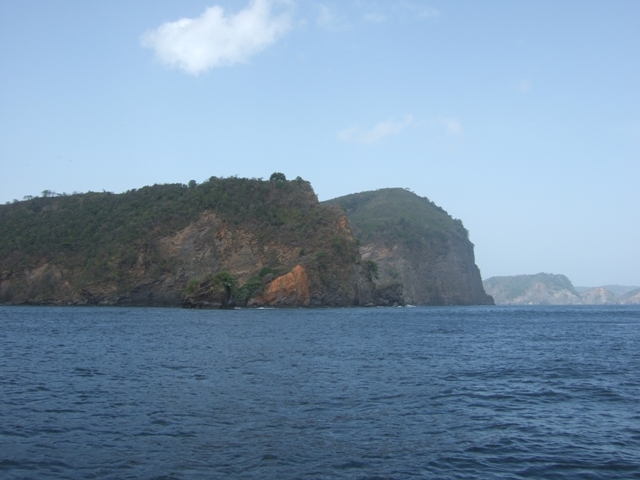 The entrance to the Boca De Monos - the channel on the north west corner of Trinidad between the Island of Monos and Trinidad. With the Orinoco river entering the sea not too far away, the current is always against you as you and as we were only going slow, it took a while to get through. The coastline along the channel. The channel goes past Scotland Bay, below. 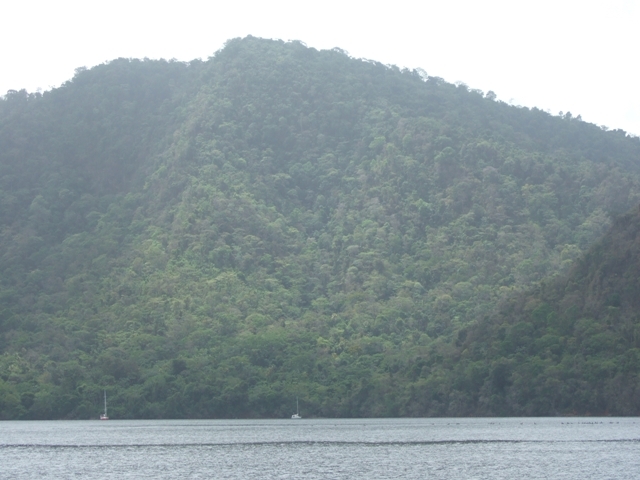 The rain forest comes right down to the sea and you can come back and anchor here once checked into customs. According to the pilot book, parrots fly overhead and you can here the Howler monkeys in the trees. The anchorage here in Chaguaramas is not great and we had been advised to book a berth into the CrewsInn marina, which we did back in January. There is a hotel alongside the marina and both the marina and hotel look good. It took us a day to get hooked up to electricity and another day to get the air conditioning unit that we had booked, installed - it's mounted outside the boat over one of the hatches and we now have a cool boat for the first time since we arrived in the Caribbean! Further north you always have the wind - day and night, so provided you can channel it through the boat it's not too bad. Here there is very little if any wind most of the time, and being the rainy season it gets very hot and humid. So the air conditioning is really needed if staying on the boat. It also helps protect the inside of the boat from mould. With the air conditioner on the deck, we won't be able to go sailing, but could probably go out for a motor trip. But for now we have several pages of jobs to do, so we won't be going anywhere for quite a while. It's quite strange as we have parrots roosting in the trees behind the marina. Just before nightfall they fly around in flocks squawking the whole time until the sun has gone down. They also squawk at dawn - that's a different dawn chorus! We haven't got the binoculars out yet to check what they are, but they are green and reasonably big!